In previous blog posts I talked about the importance of stamping your mark on Christmas and your window backgrounds. Let's now complete your display by looking at your Mid and Fore Grounds. This is the main body of the window display and generally provides the main opportunity to promote your products/message. The mid ground consists of your window kit (basis to build your displays on) and the products you want to dress/promote. A key component in the mid ground is to ensure you group the basic kit correctly first. It is vital that the whole window has a theme so that the display has maximum impact. This theme could be colour, lifestyle, brand, material/pattern, story. 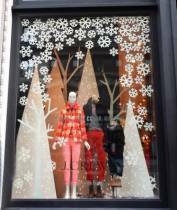 Lets talk Backgrounds on your Christmas window displays. This could be the back wall of your window or a back drop that you install. The purpose of the background is to focus your eye on the display rather than the busy environment of the shop behind. If you have a back wall this can be painted into seasonal colour to provide interest or you can attach graphics|decals to create the right mood. Alternatively you can create an effective background to your display by hanging a decorative garland or suspending decorative items from the ceiling. If you can’t get a little creative at Christmas, when can you? While your store window displays shouldn’t all be about Christmas trees and faux snow (so unrealistic here in Oz), you shouldn’t forego the festive cheer. 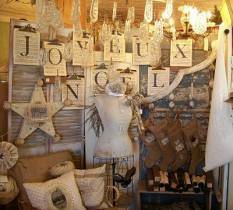 Customers will expect – and love – to see your take on Christmas window dressing, so you shouldn’t be afraid to think outside the box.For retailers across all sectors, there are a lot of ways you can spread a little Christmas cheer with your windows. 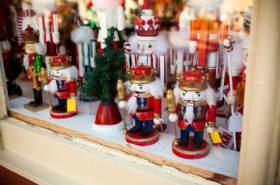 The Christmas retailing period can represent up to 40% of a retailers annual sales. Christmas 2016 generated $48.1billion in sales. And, yes, these are Australian figures. Before you start, it’s important to remember that your “Christmas Customer” is different from a regular shopper in shop. “Christmas Customer” is a gift-giver, not an end user. This means they need to be told something different by your window displays. Check out this Christmas Windows display board on Pinterest for ideas on how to be different and consider using mannequins in your window. Mannequins are silent, yet persuasive, sales staff. Festive visual merchandising needs to interrupt the customer journey and display the perfect gift for a loved one (or not so loved one). By remembering this subtle shift in shopping behaviour, you can instantly create windows that drive foot traffic. Before you start, it’s important to remember that your “Christmas Customer” is different from a regular shopper in store. While we might all be filled with a little more festive cheer at this time of year, our stress levels are up, we’re busier than ever, and we’re rushing around at 120 kilometres per hour. But perhaps the biggest difference to note is the customer journey. Your “Christmas Customer” is a gift-giver, not an end user. 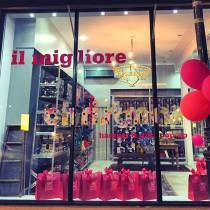 Let's look at window displays, hot spots and standing out from the crowd. Creating a dominant window display with significant impact from a distance should be the aim of every retailer. It is important not to over-complicate your layout. Make sure there is one strong simple message coming through. 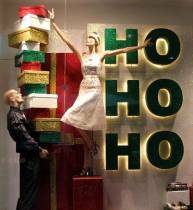 Change your window displays regularly throughout your festive campaign to keep it updated and looking inviting. Careful selection of product for hot spots will ensure the highest number of customers are passing your your most important product lines. Products in these locations need to be clearly ticketing and rotated to ensure they remain full and renewed throughout the festive promotion.